I'd marked 4 yard sales from Thurdays paper, and while I was out and about, came across another 3. 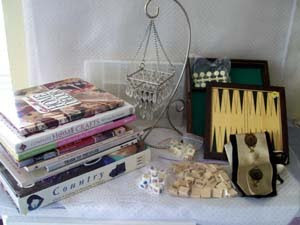 I've commented a couple of times how yard sale finds seems to go in cycles ... well,, todays cycle was books and games. Every yard sale had a nice collection of each. A stack of craft/home decorating books. I saw a few items of interest that I want to look through, perhaps try. After that, I'll put in my Supply shop. A tie with an interesting design that I thought might go splendid on a purse.